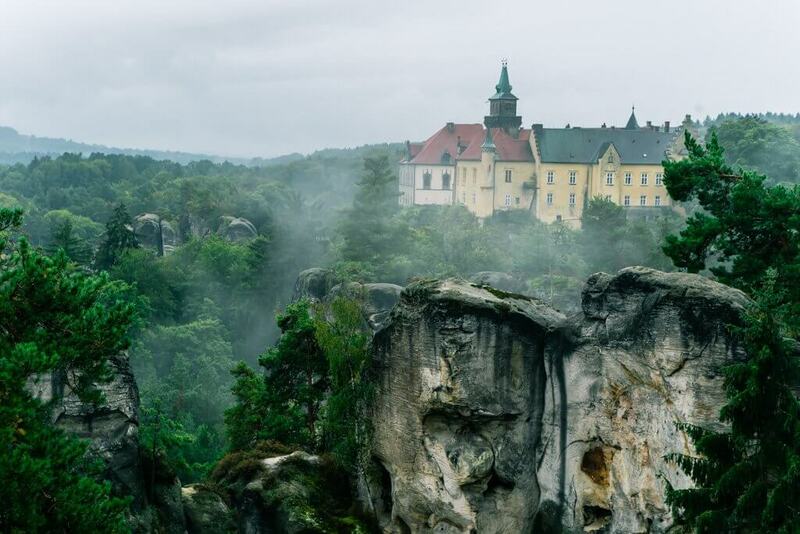 There’s a place in the Czech Republic that for centuries has inspired creative souls including painters and writers with a landscape that seems out of a dream world. 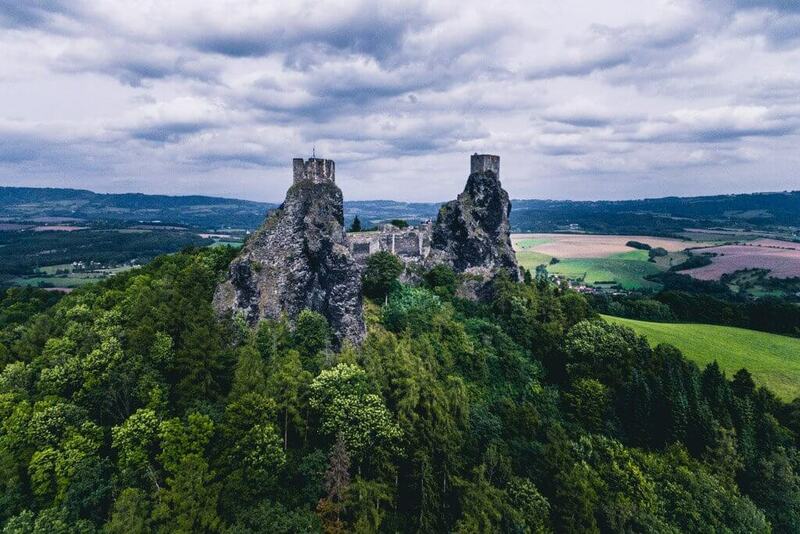 Full of incredible rock formations towering through lush forests, rolling hills, sleepy towns, castles and ruins Bohemian Paradise is Czech Republic’s PARADISE. It’s no wonder why this area was named a UNESCO Geo Park and has attracted visitors for years. This is the perfect place to go for some solitude, fresh air, and outdoor adventures. You can find peace here, even in the peak of tourist season. 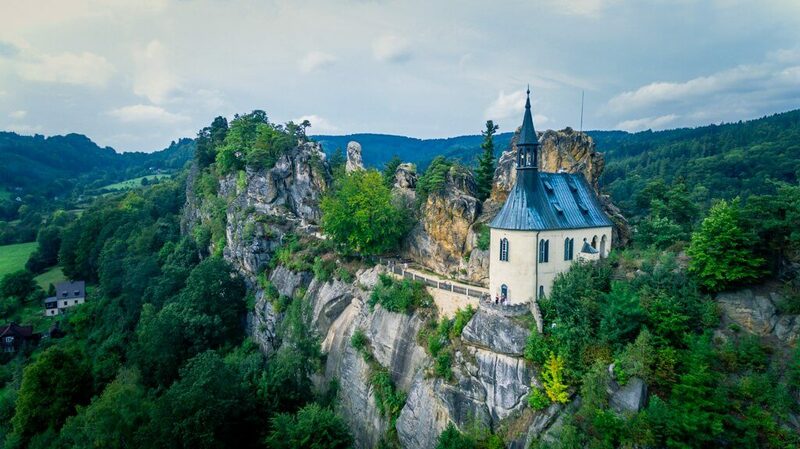 You can easily stay in a secluded house or village for peace, wander through the mazes of the rock formations in the forest, float down the river, or step back in time in castle ruins. 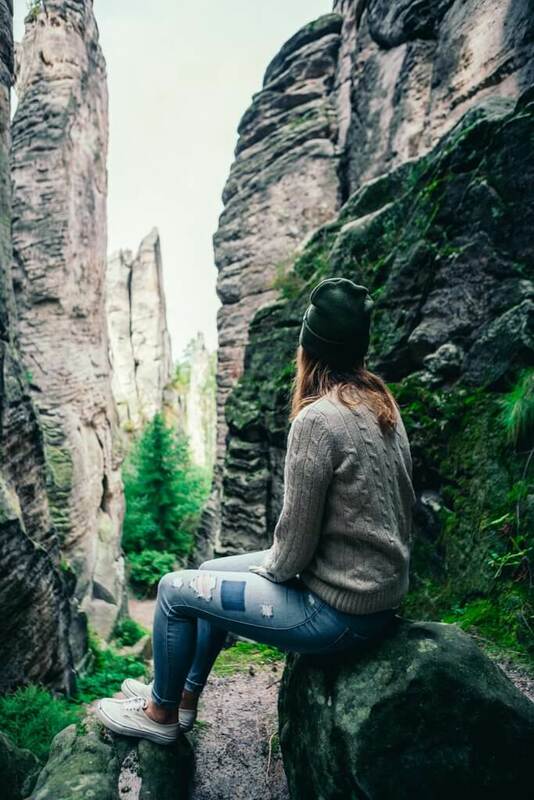 We recommend going to Bohemian Paradise to experience the side of Czech Republic that is so natural, beautiful, and almost seems forgotten in today’s fast pace society. 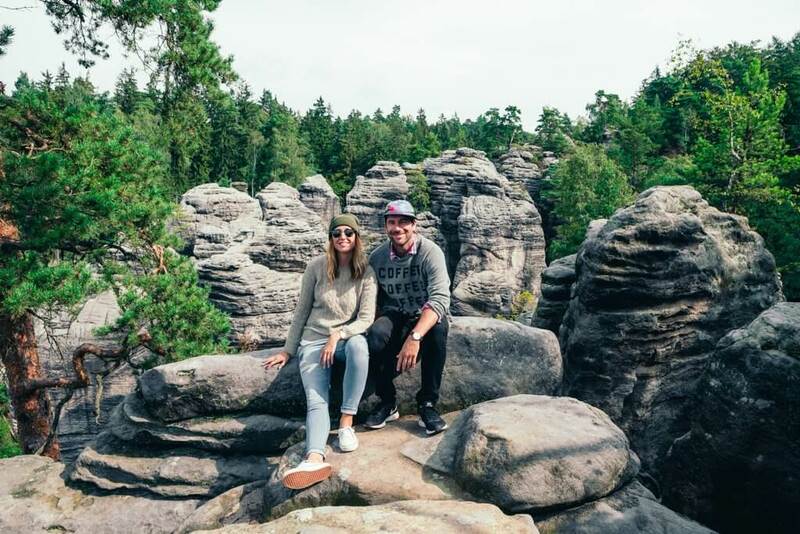 See some of the main wonders of Bohemian Paradise below from our refreshing trip. 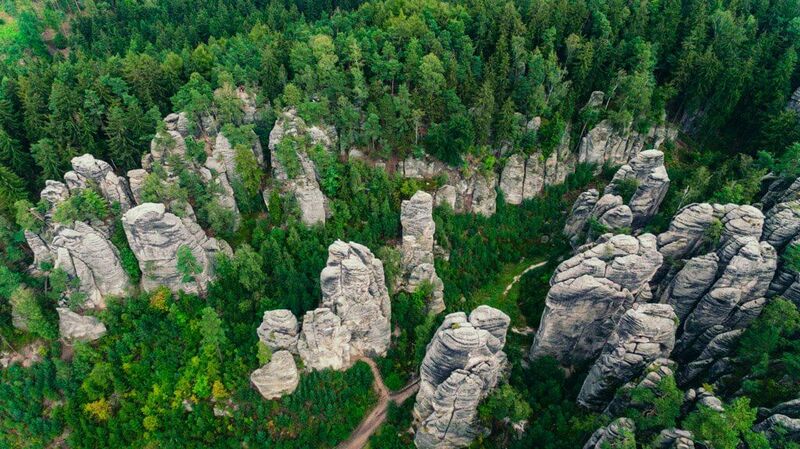 Explore the unique formations in the forest for your first outdoor adventure in Bohemian Paradise near the town of Jicin. Sandstone rock towers from over 60 million years ago eroded by wind and rain to give them their distinct towering appearance. You can weave your way through the rocks and climb up to the incredible viewpoints. These formations are also a popular spot for rock climbers. You can easily spend 2 hours here just walking from each viewpoint. Give yourself enough time to sit and take in the view a bit as well. Afterwards, you can reward yourself with a beer. Trosky Castle is made up of really beautiful castle ruins in the Liberec region dating back to the 14th century. 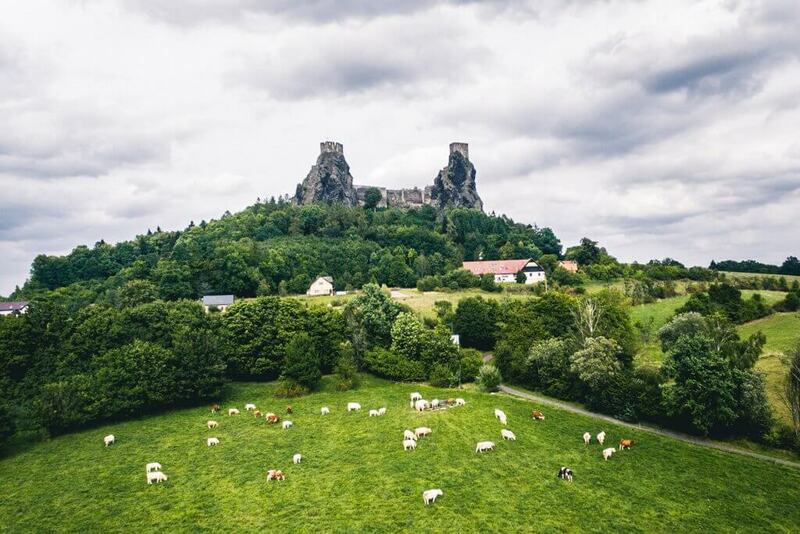 Perched on the summit of two volcanic plugs, this castle has gained popularity over the years thanks to its unique appearance and panoramic views. The two iconic towers have quirky names as well, Baba being one meaning Old Woman and the other named Panna meaning Virgin. 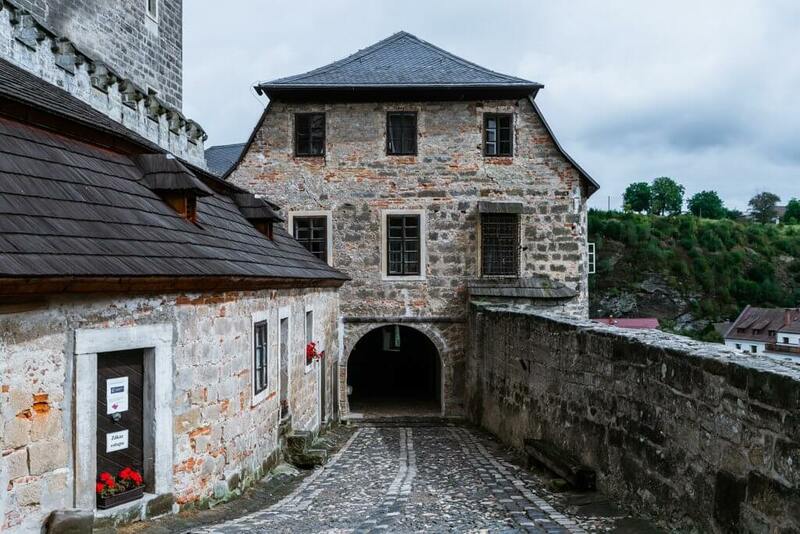 A fun tidbit of history about Trosky Castle would be that this was a Catholic Fortress during the Hussite War and was never invaded by the Hussites. It is also said that there are numerous underground tunnels, caves, and escape routes beneath the castle. However, you cannot visit these today. We witnessed a wedding going on here which was pretty incredible if you ask us! The only bummer would be the bird experience they have here. They have hawks and owls on 2-foot leashes for people to pose with photos with. We aren’t huge fans of this, especially since one of the hawks seemed really distressed and crying out the entire time we were there. Please don’t partake in this activity at the castle. Enjoy the incredible ruins and epic view instead. 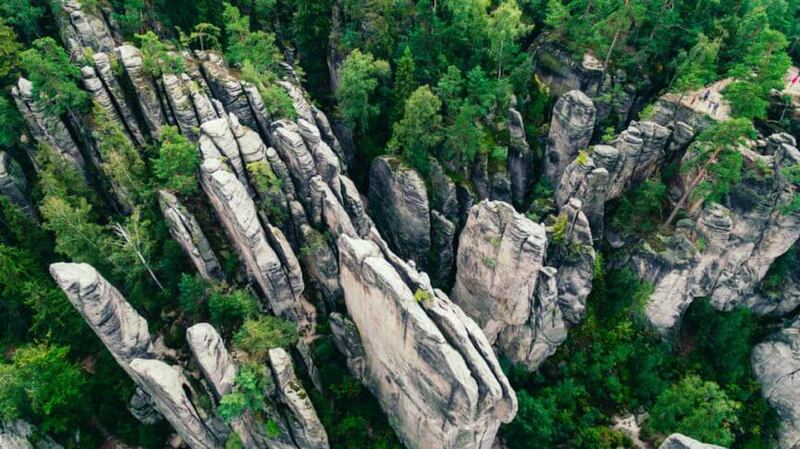 The Besedice Rocks are one of the better known natural attractions in Bohemian Paradise and can be easily seen from Mala Skala. Drive up to the entrance and wander through the impressive maze of towering sandstone rock formations and narrow passageways between rocks. There are tons of nooks and crannies to explore. Luckily there are trail markers for you to follow so you don’t get lost. Be sure to check out the multiple viewpoints and make your way to the famous secret meeting location for Jan Hus and his Hussite followers in the rock cluster in the forest. 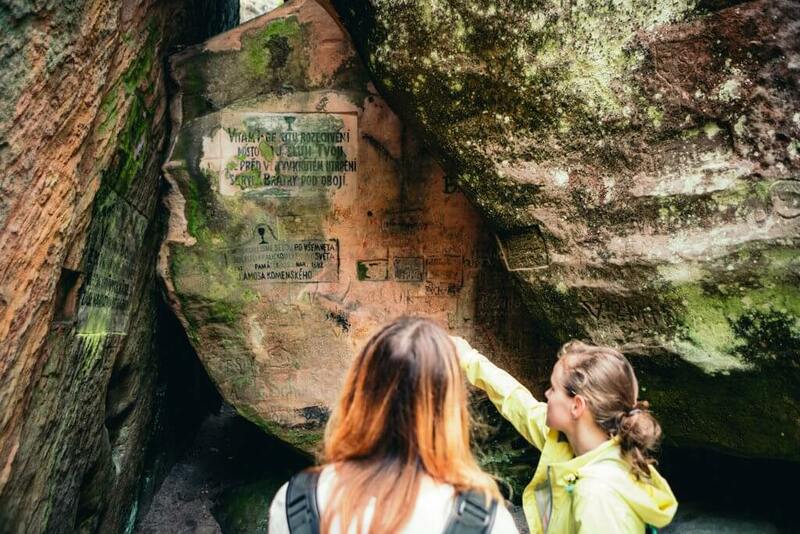 You can identify this spot on your own by all the tags and carvings in the rocks as well as the chalice symbol. Give yourself about two hours to explore by foot. If you go earlier in the morning like us you will get the entire place all to yourself and find it to be very peaceful, by mid-morning there were more people. The Vranov Rock Fortress, aka Pantheon is an unmissable site from Mala Skala. 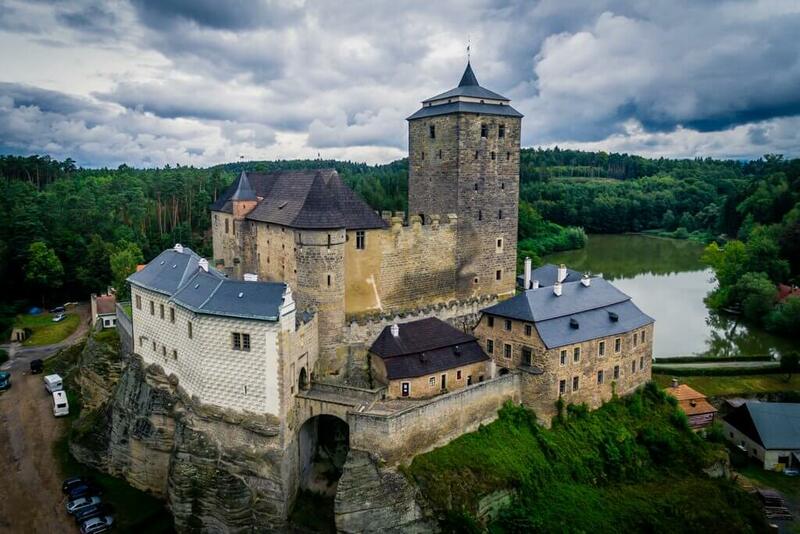 Nestled above the Jizera River on a cliff is the striking remains of Vranov. The castle that looks more like a chapel dates back to the 15th century when it was built. It is said that Vranov was used as a base for Hussite troops in the area. The remains of the castle are a bit of a mystery but you can follow along on the English brochure to find out what each chamber and room probably was including a kitchen and a kitchen dump pit where tons of animal remains were found. After exploring through the narrow and steep stone stairs it’s hard to imagine how anyone could possibly carry or haul anything up here. There were a few times I had to focus on my footing rather than oohing and ahhing at the remains of this ancient fortress. Be sure to check out the viewpoint about 500 m from the entrance to the castle as well. It offers a great lookout point to Mala Skala and the Jizera River below and great for a photo. You can continue to walk the 2km distance to the other nearby castle ruins of Frydstejn. 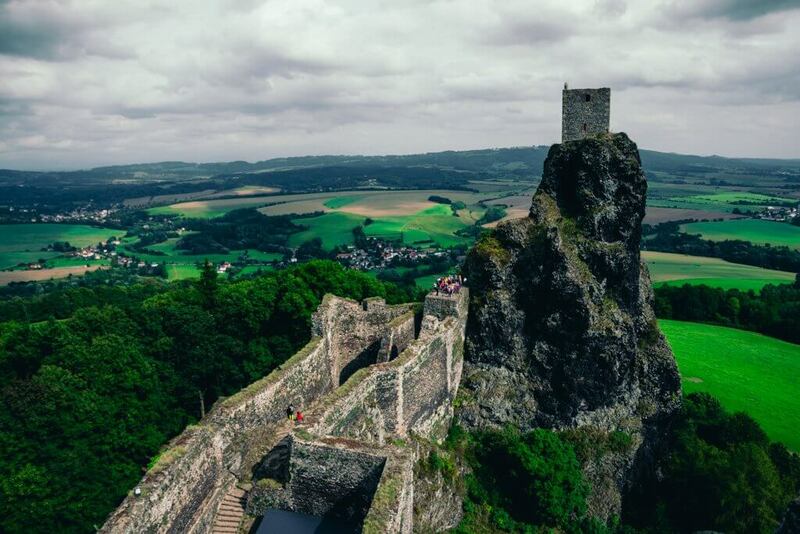 Another impressive castle in ruins in Bohemian Paradise and easily accessible by foot from Vranov Castle Ruins, or by car! Dating back to the 14th century Frydstejn was originally a Catholic castle that was taken over by the Hussites. By the 16th century, the castle no longer had inhabitants, so it sort of had a short run compared to the other castles in the region. The large tower is the most impressive feature and worth a peek from on the ruins. 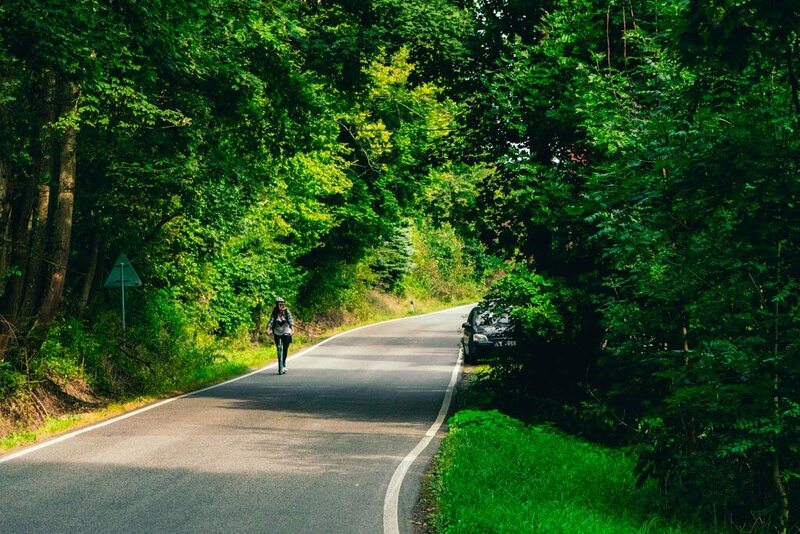 It’s a nice leisurely walk through the forest from Vranov so be sure not to miss it. 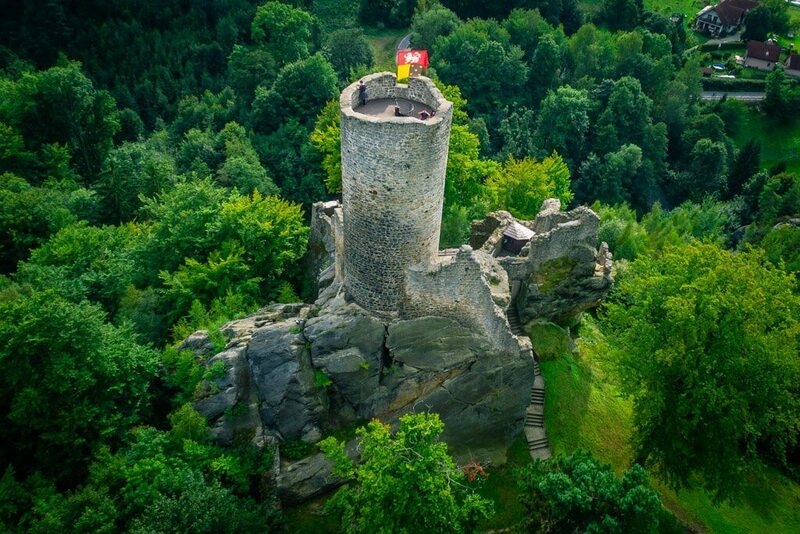 Another incredible place to visit in Bohemian Paradise is Castle Hruba Skala. 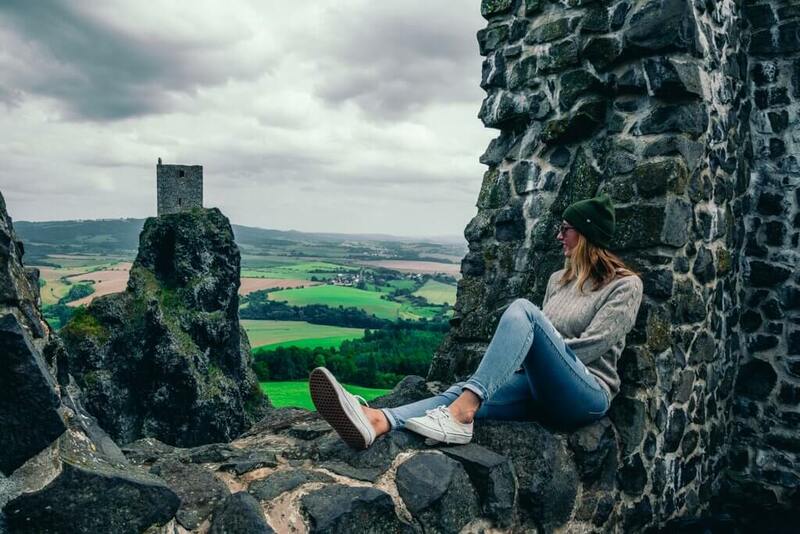 Not only do you have a castle to explore with a tower and a viewpoint but you have an extensive network of rock labyrinths you can hike through, and even see the ruins of Trosky Castle off in the distance. 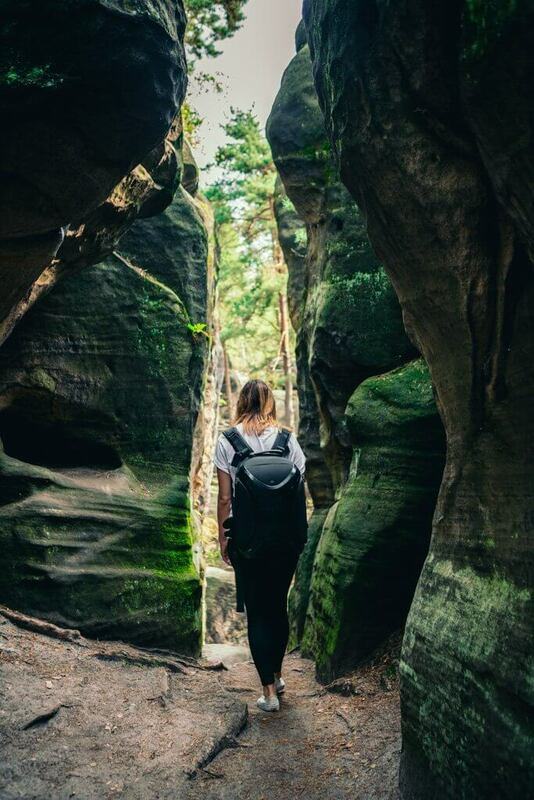 Start by following the trails through the rock towers up to the viewpoints. We came on a rainy day so we had a really cool mysterious fog that went along with our medieval castles. Be aware though, because sandstone can be very slippery and dangerous when wet. Afterwards, you can check out the castle and the small castle complex. It’s not as large as many of the other castles in the Czech Republic and most of this castle is a hotel that you are unable to visit. But you still get a great view of Trosky Castle in the distance and the beautiful landscape of Bohemian Paradise from the castle. The clock tower isn’t that tall in height, but since it’s perched on top of a cliff with the rest of the castle you get a killer view from up here. Afterwards, if you’ve worked up an appetite you can enjoy a hot meal at the castle hotel restaurant. There is also a display of the replica crown jewels here. While the exhibit is small, it’s worth taking a peek while you’re visiting. You can easily spend a few hours here if you end up walking through the rock labyrinths and to the different viewpoints. Don’t let the rain stop you either! If you only have time for one castle in Bohemian Paradise, this is it. Not only is this castle famous for filming the US movie Hanibal Rising, but they offer great tours of the castle. We really believe that these historical monuments and places come to life with a good storyteller, guide, or tour. We had all three when we were at Castle Kost. The castle tours take you through the various rooms inside the castle including the Golden room which was the famous filming room for Hanibal Rising that offers a ton of natural light from its large windows on either side, the dining hall, the black kitchen, their torture chamber, and a few more. The torture chamber was sort of surreal and just thinking about people getting horrifying punishment and torture on these barbaric machines made our skin crawl. Apparently, it is very rare for a torture chamber to actually be in a castle, as they were usually in prisons so this also made this area of the castle rather unique. There were also mechanisms that were meant for shame on display in the torture chamber including a crazy looking metal rabbit mask that was for women who were caught listening in at the door at places they shouldn’t be. The woman wouldn’t be killed or harmed, but instead humiliated for having to wear the rabbit mask for days so everyone knew she was a snoop. We were told by our guide that this was only for women, men apparently didn’t nose around where they didn’t belong back then. While walking through the outdoor courtyard we couldn’t help but notice a resemblance to Winterfell in Game of Thrones. However, this was more of a personal observation as they surely didn’t model or film GOT from around Castle Kost. They even offer great tours for families where the guides are dressed in medieval costumes and base the tour on the fairy tale aspect for kids while the adults accompanying their children get to see the castle. We thought that was pretty interesting, even though we do not even have children! 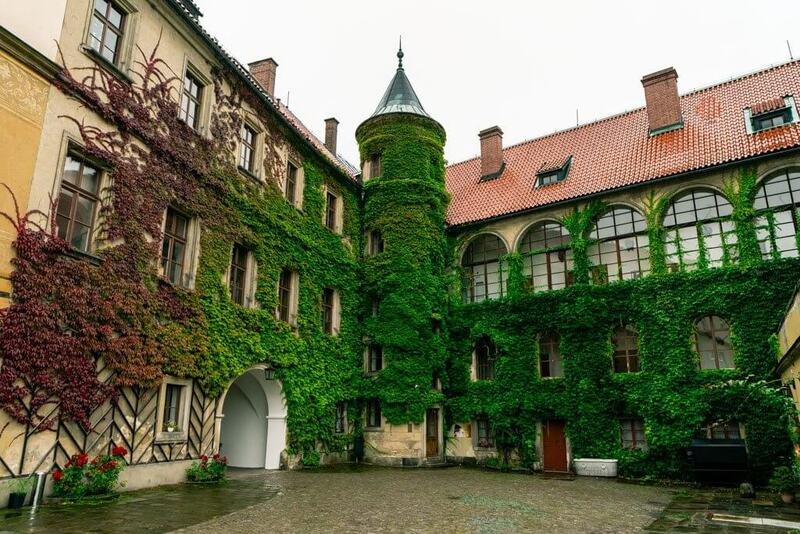 Castle Kost is not only one of the best-preserved castles in Bohemian Paradise, but also considered one of the best preserved gothic castles of the entire country. We had never seen an adult version of a Razr scooter until we came to the Czech Republic. We would see them few and far between during our road trip through the country but as soon as we got to Bohemian Paradise they seemed to be ubiquitous. These bicycle scooters are very popular by the locals as you will see dozens upon dozens while you’re driving around the area and honestly it’s a great way to get around. You can rent them for a day to get around by the Jizera River or pick one up at the end of your hike from Vranov to Frydstejn and scoot down the hill back to your starting point for the return spot. You feel a bit nerdy your first time but you’ll fit right in with the locals who are hitting top speeds going down hill on these scooters! It is definitely worth trying. 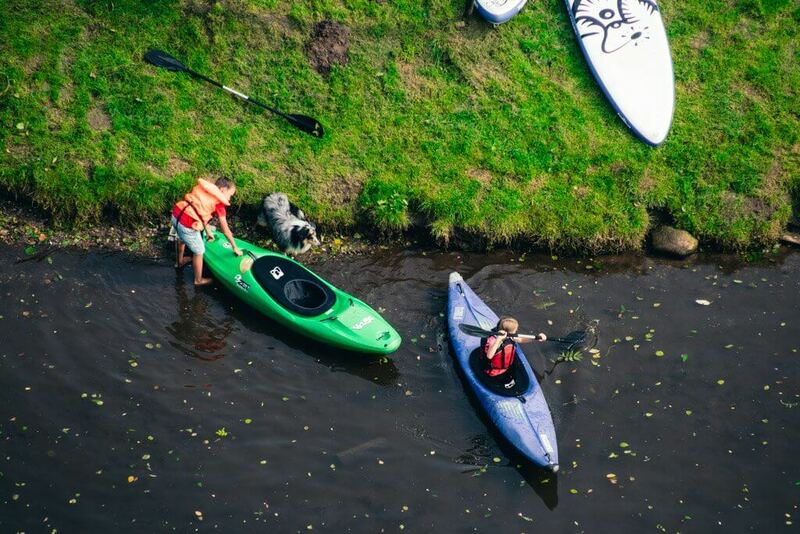 Float down the Jizera River overlooking the beautiful scenery via canoe. There are a few rapids, but nothing to be too intimidated by. After you finish your journey you can return back to the starting point either by scooter to get your local experience or by train. Rent scooters and kayaks from the Sun Disk Family facilities. 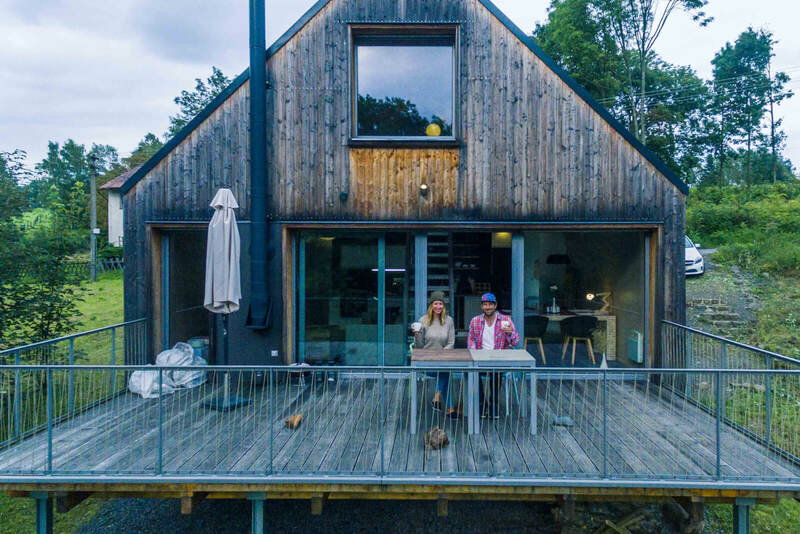 While you’re reconnecting with mother nature during your trip to Bohemian Paradise why not seclude yourself from city life altogether by staying in a concept house on your own little plot of land? We stayed in Domesi Concept House with Amazing Places and loved how removed we were from everyone and everything else. Not only are concept houses sustainable but they are cozy and have a great feeling of being at home while traveling. Hotels are great, but having an actual home is ideal for fully equipped amenities like a kitchen and living room. We loved the patio overlooking our very own small pond. We also enjoyed all the natural light coming in through the windows. And if you want more privacy you can use the automated blinds to close you off from the outside world. This is great for couples, families, or a group of travelers since there’s more than one room. Bohemian Paradise is pretty spread out and best visited by car, otherwise, you will be very limited with what you can see or experience. We recommend spending 2-3 full days at least hit up the highlights of the area. Our trip took about 2.5 days to see all of these sites. The English speaking in the area is limited but not impossible to find, be sure to come with a translation app or know a few key phrases before coming. If you plan on doing tours be sure to check and plan what time the English speaking guides will be giving tours so you do not miss out on all the interesting history. Some places like Vranov Rock Fortress will give you an English brochure to follow along while you’re at the site. Most of all, be sure not to miss the rock tower mazes and labyrinths while you’re here! They really are what makes this entire area special and even more picturesque. 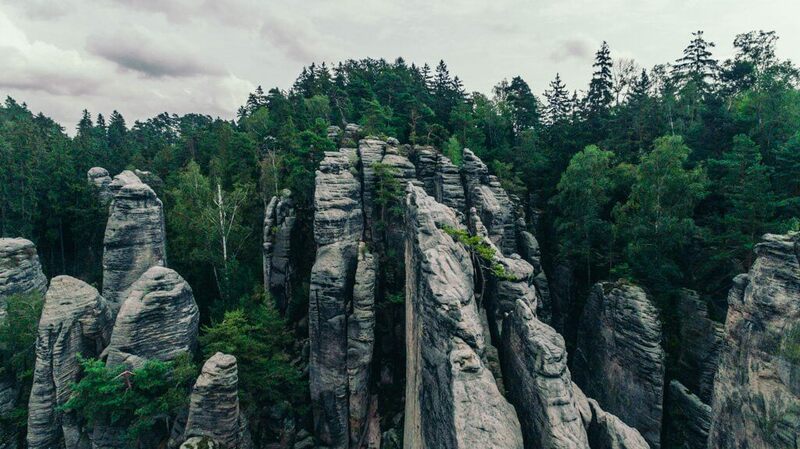 If you love the beauty of Bohemian Paradise then you will also love Bohemian Switzerland. 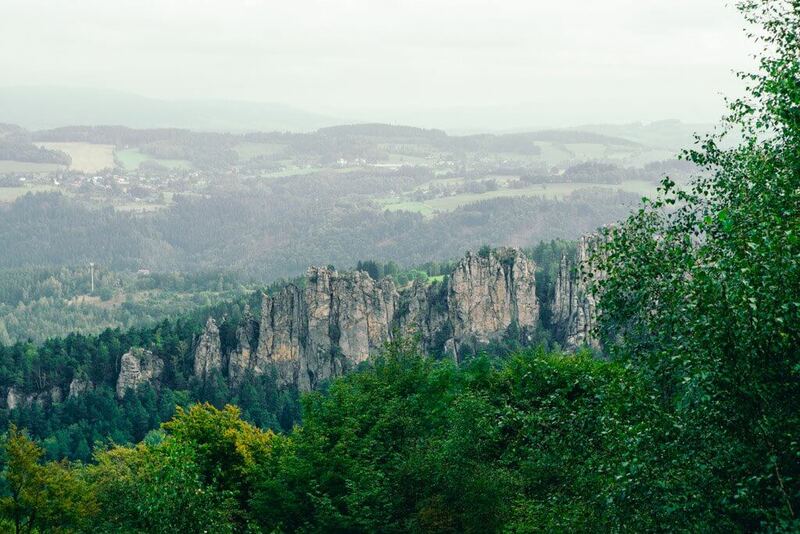 Be sure to check out our experience at Bohemian Switzerland here. We found Bohemian Paradise to be one of the most unique things to do in Czech Republic, be sure to see what else made the list! Liked this post? Share the love below on Pinterest.